John Nunemaker shares a photo with me of his horse Queen as a colt. March 2016. I have always been captivated by John Nunemaker’s story of finding his family’s work horse Queen on his ship when he reported to the S.S. Queen’s Victory in September 1946. John’s father had sold Queen that January, and there she was, on her way to Poland just like John. 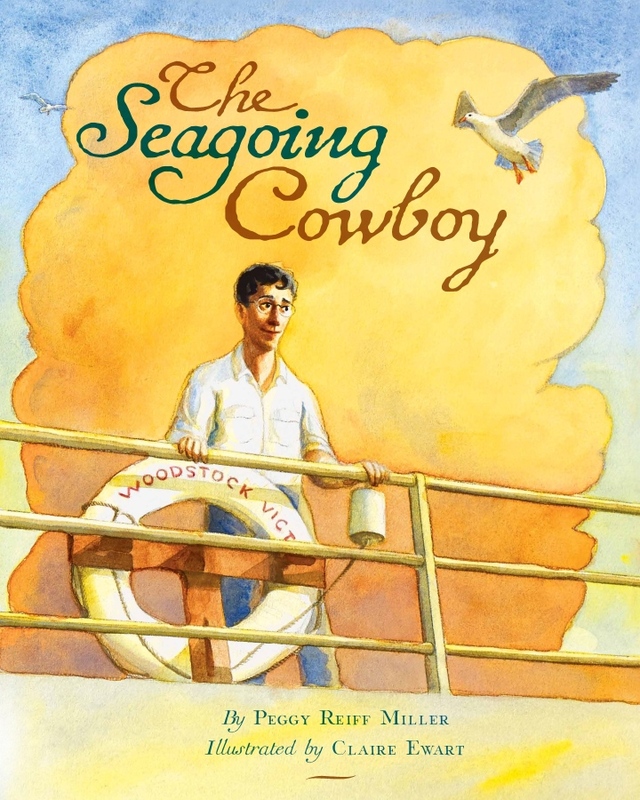 His story found its way into my picture book, The Seagoing Cowboy, that was released the end of March. Queen as a colt on the Carl Nunemaker farm, Goshen, Indiana. Photo courtesy of John Nunemaker. The real Queen (Queenie in the book) was a four-year-old bay when she was sold at the Goshen (IN) Community Sale to an Eastern horse buyer. John recognized Queen because her right shoulder had been injured while clearing ground, resulting in permanent loss in the right shoulder muscle. “No doubt about it,” he says, “Queen knew John N. and John Nunemaker knew Queen.” He was able to take care of her all the way to Poland. John identified with the story in the book and sent me a delightful letter of comments and additions to his story. He traveled to port from Elkhart, Indiana, by train with a friend, Robert Stichter, and recalls the excitement and adventure he felt at age 18 as he carried his duffel up the gang plank. He notes the four shots he got before going on board were his first shots ever. John Nunemaker’s Merchant Marine card making him an official cattle tender for UNRRA. Photo courtesy of John Nunemaker. John Nunemaker adds his autograph to The Seagoing Cowboy at Better World Books, April 1, 2016. Photo credit: Abbie Miller. New Year’s Day seems a fitting time to announce the coming release of my picture book about a seagoing cowboy’s journey to Poland. The story has been beautifully illustrated by Claire Ewart and can now be pre-ordered at Brethren Press. I will soon be launching an expanded and updated seagoing cowboys website that, besides the current historical materials, will include information about the book and my activities. This blog will continue with historical posts on the second and fourth Fridays, and I will be adding personal posts along the way about my own journey with the seagoing cowboys and Heifer International. I invite you to journey with me in 2016. And please invite your friends to join the ride!